Sharma asked how non-violence could be affective against the threat of the use of nuclear weapons. His Holiness pointed out that whereas in the past people lived in smaller isolated communities, today, we are all interdependent. Therefore, to harm others is ultimately to harm ourselves. He added that we are united in a global economy to which there are no boundaries, but also face together the perils of climate change. The days of warfare as a result of which one side would be victorious and the other defeated are gone. This is why, he said, the 21st century should open an era of peace. Asked if we have forgotten Gandhi and what he stood for, His Holiness replied that he is great admirer of the spirit of the European Union which considers the common interest before narrower local concerns. He suggested that in the light of such a consideration Tibet could remain with the People’s Republic of China. Being materially poor, Tibet could benefit from the development China can provide. However, because Tibetans are spiritually rich, Chinese Buddhists could benefit from their sharing their knowledge of the Nalanda Tradition with them. He asserted that this is a realistic approach. In the Maurya Sheraton Convention Hall, the Economic Times had convened an Indian Leadership Council which it invited His Holiness to address. The organizers received him warmly at the door and escorted him onto the stage in the hall. 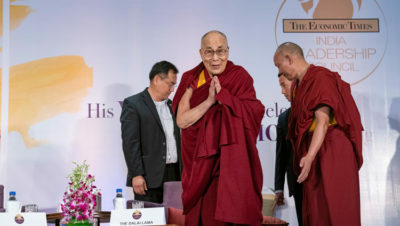 Deepak Lamba, President of Times Strategic Solutions, welcomed His Holiness and introduced him to the 100 or so business leaders waiting to listen to him. He also introduced film-maker and activist Mahesh Bhatt who was going to moderate the meeting, especially the question and answer session. In his preamble, Mahesh Bhatt recalled meeting His Holiness at an award presentation associated with Mother Teresa. He had been struck by his saying, “Only he who wants enlightenment for everyone is enlightened.” He suggested that this is a time when the educators have to be educated. He wondered if there is a need for a new narrative, but asked from where should it come. 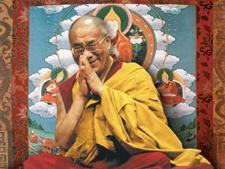 He noted that the Buddha said, “Be a light unto yourself.” He turned to His Holiness and asked him to reignite hope. “My dear brothers and sisters,” His Holiness began, “I always open my talks this way because it is so important that we see each other as brothers and sisters. Basic human nature is compassionate, and yet we face numerous problems that are of our own making. “We have so much in common. Our mother gave birth to us and nurtured us with love and affection. In day to day life, if I smile at you, you’ll probably smile back and when you respond in a friendly way, I feel happy. “When we are born, we have no idea of nationality or religious faith. We are just human beings who want to be happy. We are social creatures who need to live together as friends. An affectionate response brings a smile, which leads to trust that can grow into friendship and so bring us together. Genuine friends are those who continue to support you when things are difficult. For example, I lost my own country but have spent almost 60 years among friends here in India. We Tibetans think of ourselves as students of ancient Indian masters and so have a strong affinity and respect for India. “In the 8th century CE, the learned scholar Shantarakshita established the Nalanda Tradition of Buddhism to Tibet. He made clear that it didn’t just involve prayer, but the study of difficult texts with logic and reason for 20 or 30 years or more. This knowledge from ancient India is wonderful because it enables us to understand and come to terms with our emotions. It also, incidentally, prepared me well to engage in discussions with scientists. Asked how to bring empathy into business, His Holiness acknowledged that business is necessary for the economy to grow, but in the world’s most populous democracy it is also necessary to cultivate concern for others. He noted that desire had been integral to human evolution, but plain desire is realistic in a way that greed is not. Contentment is useful, particularly when it comes to keeping a calm mind capable of analysis in the face of stress. He remarked that close-to a problem may seem insuperable, but from a broader perspective can appear more manageable. His Holiness mentioned that viewing people in terms of ‘us’ and ‘them’ and neglecting the yawning gap between rich and poor are both sources of conflict. Potential solutions here in Delhi and Mumbai could include helping street children gain access to education. One questioner wanted to know if there would be a 15th Dalai Lama and His Holiness replied that in 1969 he made it clear that the question would be decided by the Tibetan people and others who may have an interest in the matter. “It’s not as if the survival of the Buddhist tradition depends on it. There is, for example, no recognised reincarnation of the Buddha. Monks and nuns studying for 20 years and more can ensure the longevity of the teaching. “I retired from political responsibility in 2001 when we first achieved an elected leadership. As far as democracy is concerned we’re ahead of China. As I said, the Tibetan people and people of the Himalayan Region will decide whether to recognise a 15th Dalai Lama. If we look back, the 1st, 2nd and 3rd Dalai Lamas were wonderful. After the 4th, the 5th was great. He really developed the institution and established the custom of taking responsibility for temporal and spiritual affairs. The 6th was naughty, the 7th was humble, and the 8th was good, but the 9th, 10th, 11th and 12th didn’t live very long. The 13th was very good. His Holiness advised that if you feel that people are taking advantage of your love and compassion it’s acceptable to take appropriate measures. To do so is realistic. If you are too kind to children you spoil them. Therefore you have to employ compassion with wisdom and intelligence. Deepak Lamba presented mementos to His Holiness and to Mahesh Bhatt as he thanked them for their participation. Members of the audience gathered on the steps to the stage to have photographs taken in groups with His Holiness, following which His Holiness left for his hotel. Tomorrow, he will travel to Mumbai.